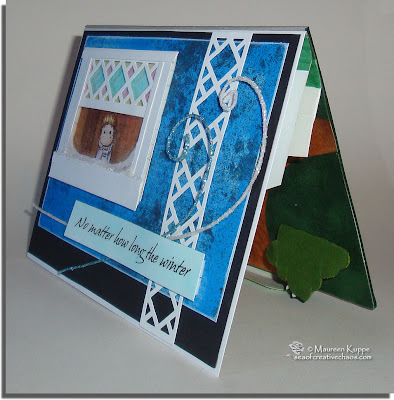 Time for a pop-up card. I love doing these, so about a week ago I began with a mock-up to test out some ideas that were floating around my head. 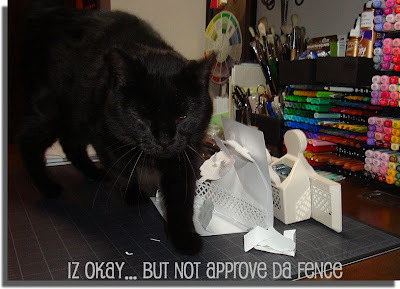 Dakotah wasn't too thrilled with the design it seems; she chewed up a fence I made using the Martha Stewart Garden Trellis punch! After I decided what would work and taking "Approval Cat's" recommendation to heart, I began to build. Using a Mini Lazy Summer Day Tilda I made her a frosty window to stare out into the snow, wishing Spring would finally arrive. I started out with clear cello, used my MS Garden Trellis punch (shhhh... don't tell "Approval Cat"!) to create a stained glass window (Copic colours RV34, BG45 and Y15), layered some white cardstock for the window frame and popped it up on foam over Tilda's image and some background wood panelling paper. 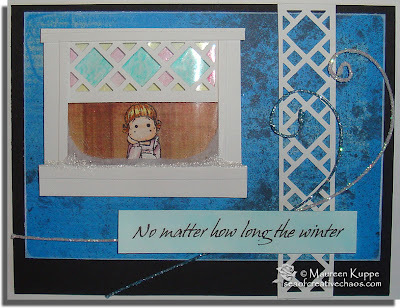 No-name white flocking with clear Aleene's glue added the frost on the window and Frosted Lace Stickles was used for snow. Inside the card, her wish is granted! 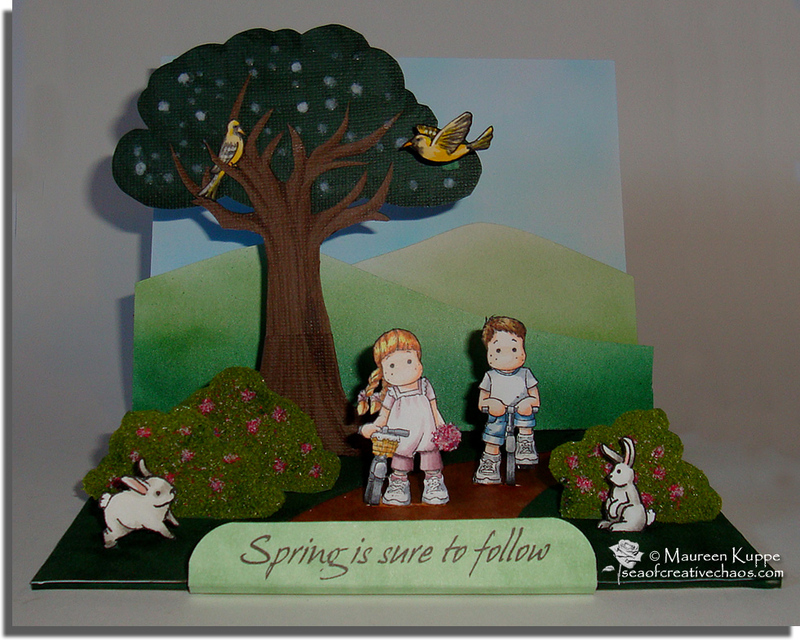 Tilda and Edwin go on thier first Spring bike ride through the countryside. I used Mini Edwin with Bike and Mini Tilda with Bike. I started by using my new Copic Airbrush to do the sky in B000 and B02. Then I airbrushed the path with E33, E35 and E49, adding texture with the Colourless Blender. The hills were airbrushed using G21, G24 and G29. 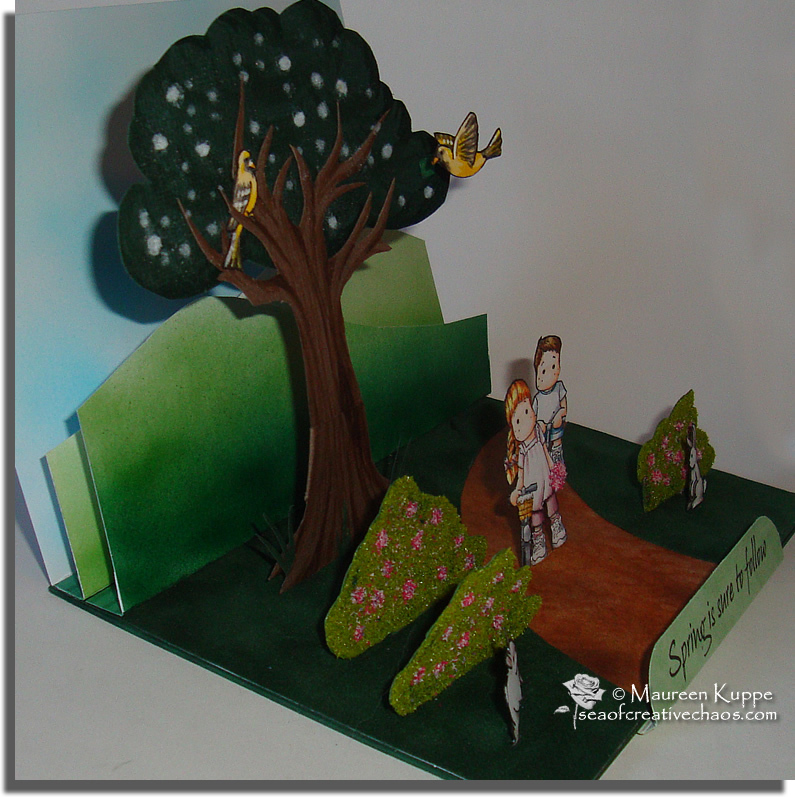 Next I cut out some dark green flocked paper for grass. The bushes are covered in Flowersoft Sage and Raspberry Fizz. You may notice Tilda's been picking the flowers off the bushes; in her hand is a Raspberry Fizz bouquet. 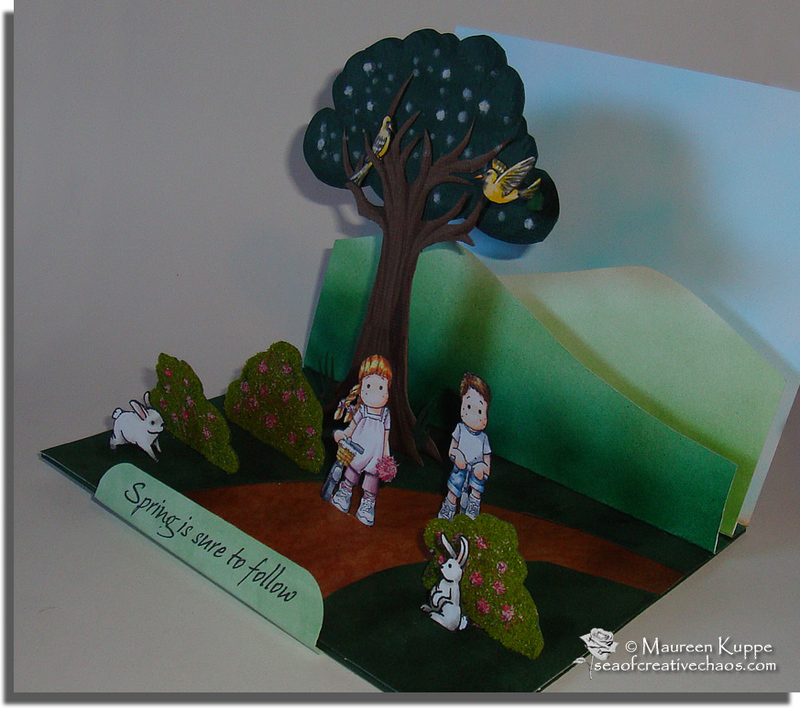 The bunnies were hand-drawn and coloured with W00, W1, W3, W5 and R21. I knew the tree would have to "telescope" to fit inside the card when folded up. I used brown and green cardstock, added dimension with Copics (leaves: G24, G28, bark: E33, E35, E44, E47) and then added two birds (W6, W7, Y19, Y21 and Y38). Tilda and Edwin's Copic colours are: E0000, E02 for their skin, E55, E57, E59, B91, B95 and B97 on Edwin, C0 - C10 and YR24, YR31 for the bikes, RV91, RV95, RV99, Y11, E97 and E99 for Tilda. After all that, I am pleased to find it DOES fold up! 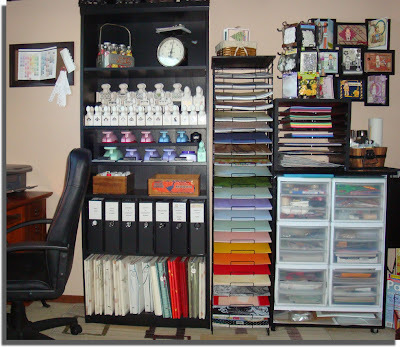 When I first started scrapbooking back about 2006, I had ALL my supplies in three containers strapped to a cart I would wheel out from a closet to spread out on our dining room table whenever I felt the need to get creative. I used two tackle boxes for the smaller stuff and a small Cropper Hopper for my paper. Wow... how far I have come in five years. I now use daughter's old bedroom (after she moved downstairs); it's small but cozy - a great place to create and relax with the dog at my feet and three cats ever present to keep me company. Other than a single picture of when I repainted and first set up the room a few years back, I don't think I've ever added phots of my entire craftroom here. Be warned however; there are quite a few photos! So if you have the time, grab a cuppa and click on the images to biggify for closer looksees. First, here is my main workspace. 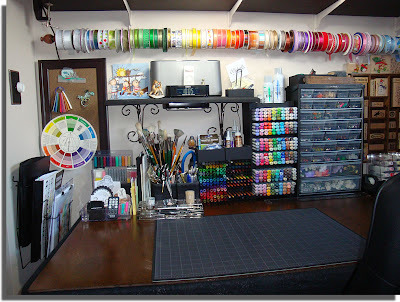 My favorite things about this space are the wooden stamp storage trays (one is a vintage printer's drawer) on the walls, the 6 foot curtain rod for ribbon and the way nearly everything is within arm's reach when I am sitting there. Over the table I have one long shelf to hold tools such as a Cuttlebug, Xyrons, Cropadile, embossing tools and the like. 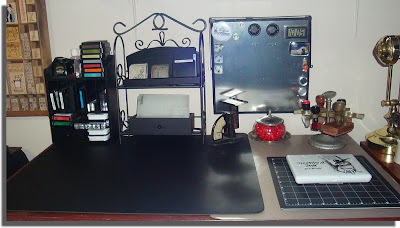 Here's a closer look of my workspace. 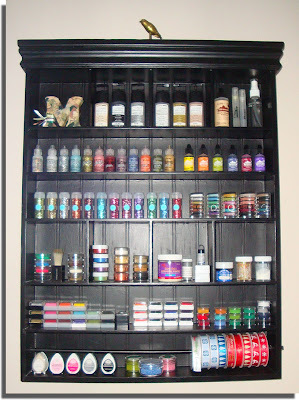 My Copics are in homemade storage containers (wooden doll's dressers sans the drawers with chipboard dividers inserted and everything painted black). I have been slowly adding antiques to the room; here you'll see my antique glass pen and ink holder, a vintage expandable carpenter's ruler and a little Occupied Japanese ceramic deer I just couldn't resist getting before Christmas. The metal tool box is great for small embellies from tiny brads to a variety of Wild Orchid flowers. I also scored a free acrylic display box that holds my Copic refills perfectly... can you believe it's a lipstick display? A local drugstore was revamping the cosmetics section and they GAVE me two displays I thought I could put to good use. To the right of this main table are two smaller desks. The first is an old desk from my aunt that has a wonderful huge single drawer to store all kinds of "stuff" ;) On top I have a few organizers to hold some stamping supplies as well as an antique scale, jar for candies (of course!) and an antique rubber stamp stand. 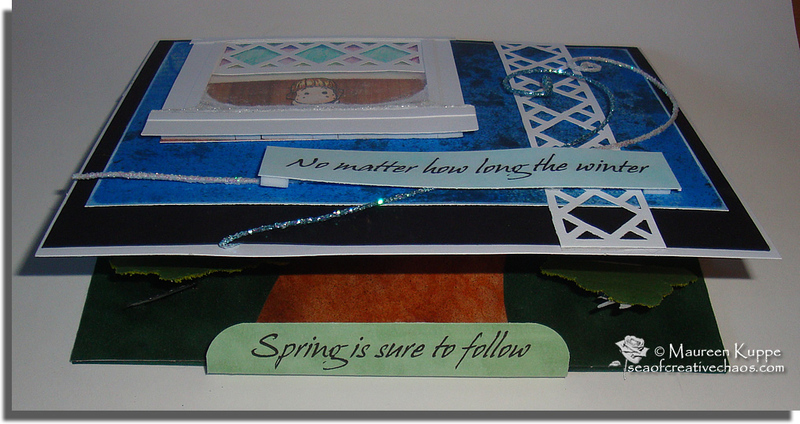 I have a few Sizzix dies and Cuttlebug folders stored here too. The desk next to that is for my laptop and printer which also has a few antiques... below it is my newest find: a gallon creamer from the early 1900s. I have to figure out what the heck I'll store in it though; when I saw it on eBay I had planned to use it for my paintbrushes, but this sucker is large and heavy! I LOVE it! On the desk is a small ceramic US military jar holding some vintage tools. Beside that is my vintage copper stapler and original Slinky! Above the printer is my brand new Making Memories Embellishment Center. I have wanted one of these for a long time; I finally broke down, used a coupon and got it for half price at Michael's. After painting it black I filled it up with my Stickles, alcohol inks, Martha Stewart glitter, ink pads, glosses and some holiday ribbons. On top is antique brass photographer's bird I picked up in Texas last fall. It is from 1907 and was used to get children's attention by chirping and moving it's beak and tail via a tube and ball the photographer would squeeze. On the wall opposite to my main work table is my shelving unit, paper display and storage cart hubby built for me. The large shelving unit has a few antiques too; a vintage metal Pepsi "basket" holds my Prima flower jars perfectly! The old postal scale is one of my favorite finds from a local antique shop. The two wooden boxes are from trips to Minnesota. I painted and stacked into steps blocks of wood so I could easily see my Martha Stewart punches. 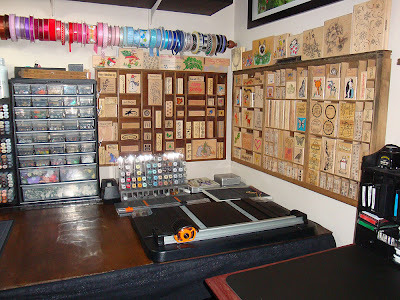 Below those are my other punches, paints, binders and scrapbooks. I keep all my unmounted stamps in these binders, along with my Spellbinders dies, stickers and miscellaneous information sheets and pamphlets. To see how I store my Magnolia stamps, take a look at a previous post HERE. The paper display I bought from our local scrapbook store when it closed. Boy, THAT was fun to repaint (NOT!) , but I love having my 12 X 12 papers sorted this way. 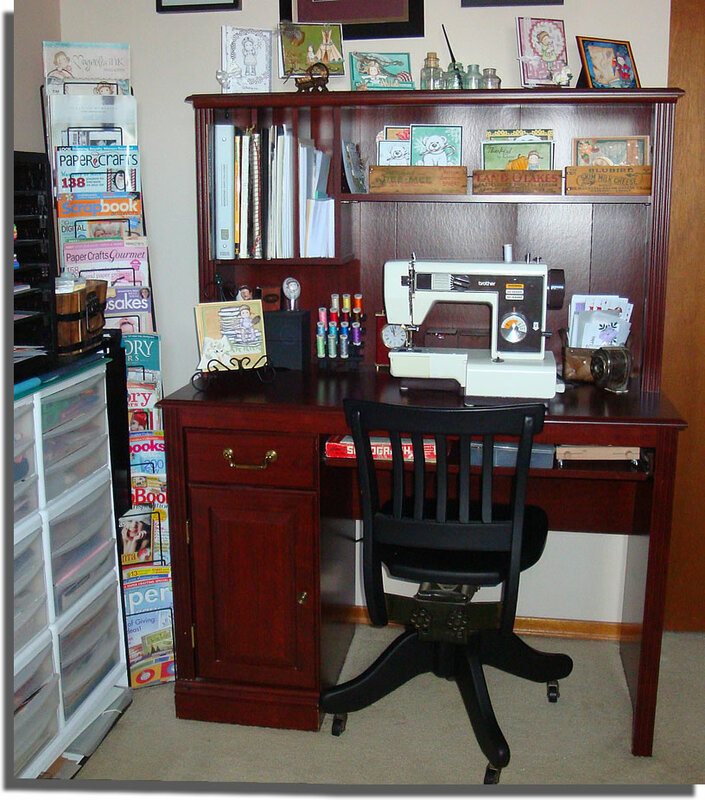 Beside this is a wooden cart hubby built for me; I added the drawers and quickly filled them will all kinds of supplies. On top is a display unit daughter pulled out of the trash at work! It's a great find and rotates to store lots of goodies! The final side of the room houses my sewing machine... so great to have it always set up and ready to use on cards (or, if needed, the odd REAL sewing job! 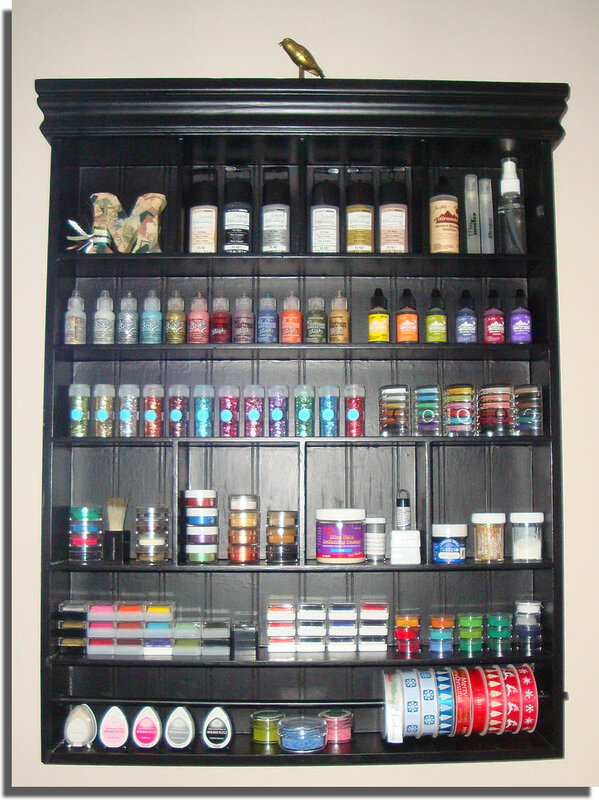 :) ) I also have a magazine rack I got from a craft store closure, that of course, I had to paint black too. On the hutch you'll see a few more antiques; a 100+ year old cast iron letter holder, some ink bottles, a cast iron floral "frog" from California, vintage Minnesota cheese boxes and my old pencil sharpener that I have yet to mount somewhere. 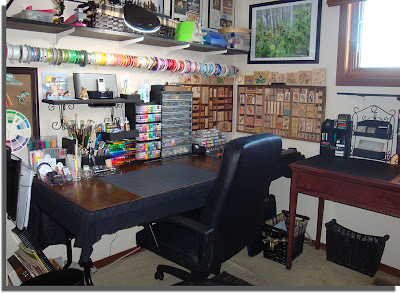 Oh and if you look closely behind the antique office chair (which, I painted black, natch), you'll see my old 1960's Spirograph sitting on the keyboard drawer under the sewing machine. So there you have it. 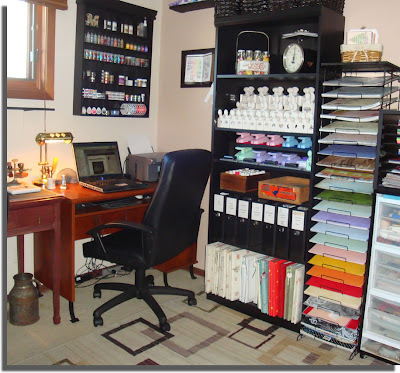 A mix of old and new all crammed into my small craftroom; my favorite room in the house! 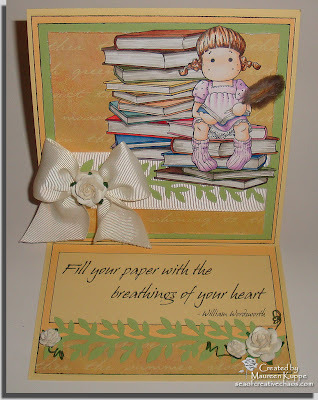 Over at my DigiDrawn digital stamp site, I have been asking for ideas and a pile of books was one suggestion... so I thought they would go great with my Tilda Writing Diary stamp. I have created two images in the set; one with ten books and a shorter stack of five books. 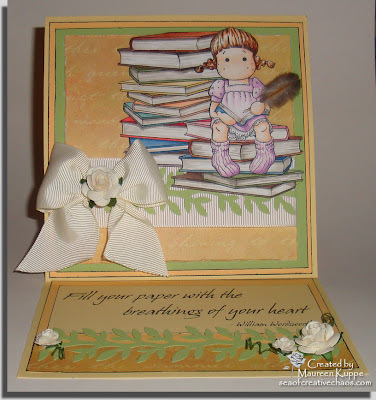 You can use them together, separately, flipped, with Tilda or Edwin perched atop or beside them! The great thing about digistamps is you can also resize them to use with the adorable Mini Maggies too! 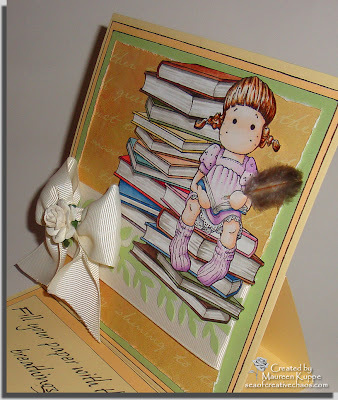 These would be great for school images or to celebrate "I Love To Read Month" THIS month! If you look closely, you'll notice my little special effect; I replaced Tilda's quill with a real feather. I simply cut down a feather I got at the Dollar Store (I bought a few bags of them when I did my Native American Tilda card - so they are going to last me a long time! Ha!). I cut two slots around Tilda's hand and slid the feather into place. 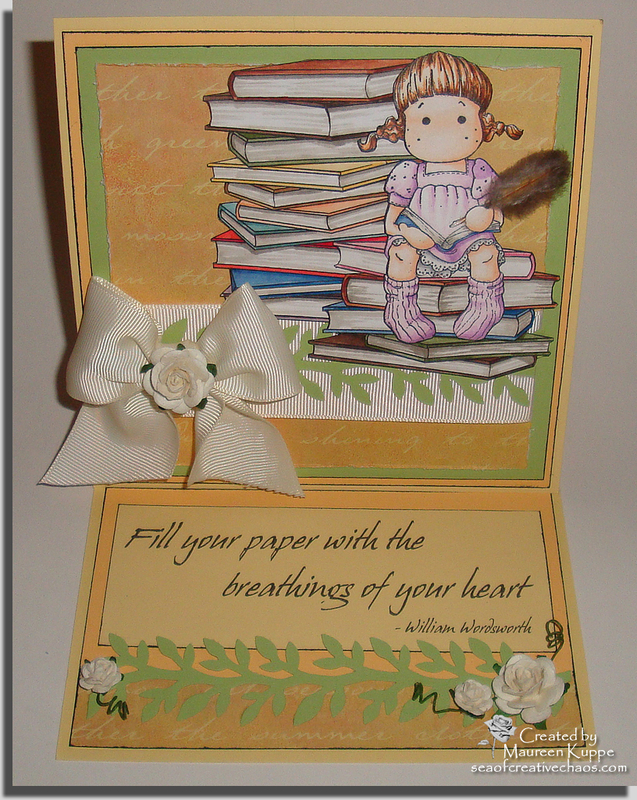 I can't recall the patterned paper I used, but with the script image it seemed to work. 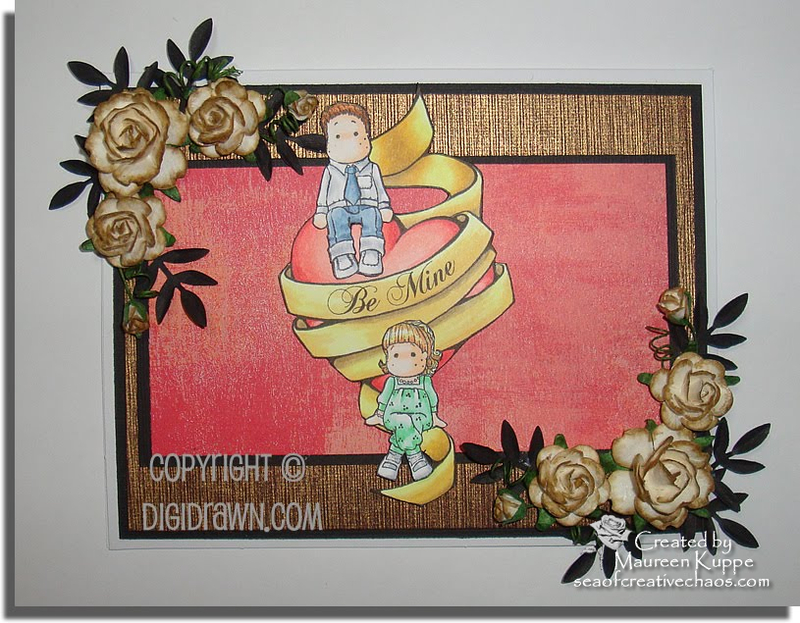 I matched the mats to the colours in the pattern and inked them with Memento Tuxedo Black ink. 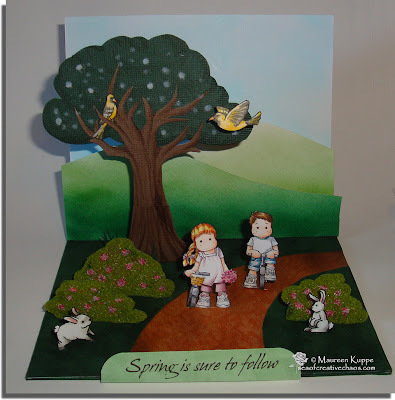 The green vine is made using Martha Stewart's Vine Trim punch. The roses are from Wild Orchid, natch. Funny story about the ribbon though. My family will confirm (with a huge sigh and rolling eyes, I must add) that I throw NOTHING away I think I will use again. This ribbon is proof of that. 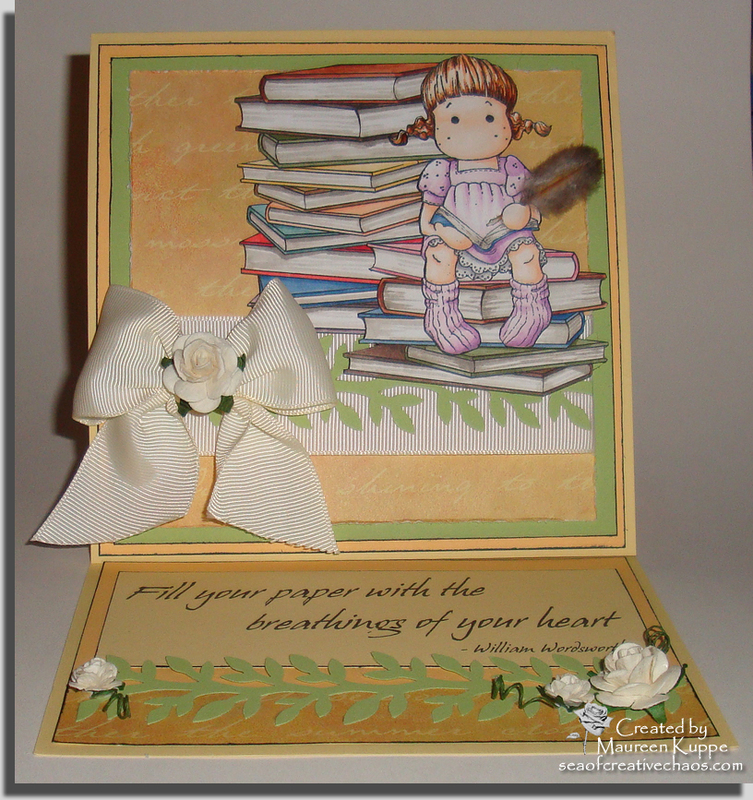 It is one of four long pieces I had kept when I bought some soft plush blankets for the chair in my craftroom. Each piece had two velcro ends so they would hold together when wrapped around the blankets... so I just clipped off the velcro on one piece and used my Bow Easy to make the bow. Another piece was wrapped around the card. I LOVE the thick width and the colour was perfect! If you want these books for your own creations, head over to my DigiDrawn site here! Anyhooze.... I thought, I wonder if those new Mini Maggies are small enough to be a doll for a regular size Tilda? I think the Easter Bunny has left dear Tilda a new toy! 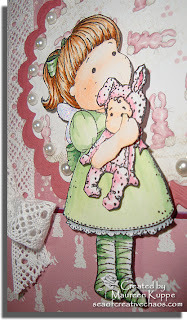 I cut off the rose, cut around her arm and also cut around the arm of the adorable Mini Little Bunny Tilda to wrap them around each other. 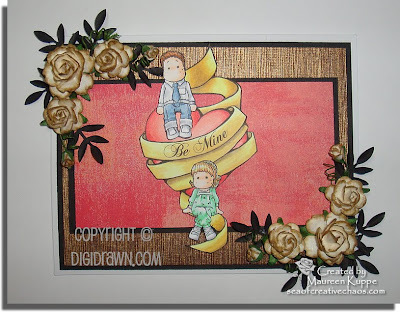 I added Bazzill cardstock to the patterned paper and inked each piece with ColorBox white ink. One layer is sewed with a zig zag stitch on my regular sewing machine. 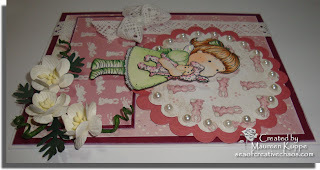 Recollections pearls were added to the scalloped circles cut with my Spellbinder dies on my Cuttlebug. 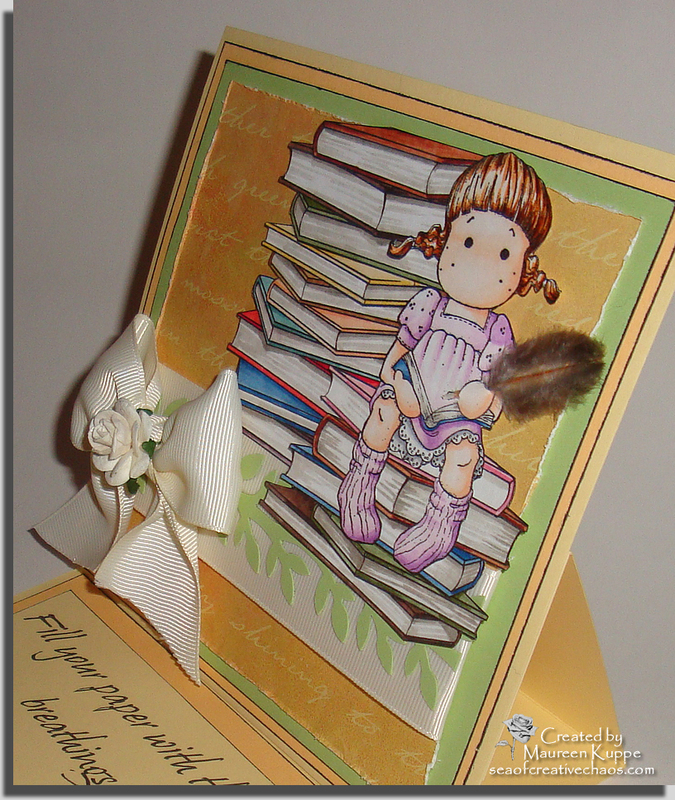 Wild Orchid cherry blossoms were used on the bottom, along with some Martha Stewart punched oak leaves. The lace was from our local Dollar Store and the bow was made using my Bow Easy (I LOVE that tool!). I also finished it off with Diamond Stickles to Tilda's wing. Just in time! I was doodling at my desk the other day (shhh! 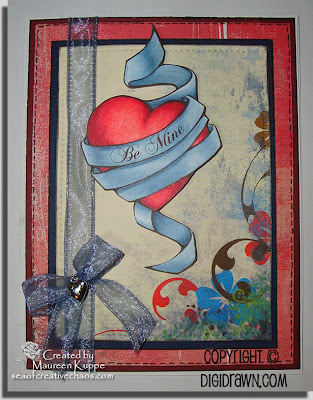 don't tell my boss that...) and came up with this ribbon-wrapped heart. Well, I DO work in Cardiac Sciences..... ahem. With Valentine's Day coming up fast, I thought this should be my next digi stamp. When daughter saw it coloured in, she commented that it almost looked like a tattoo! 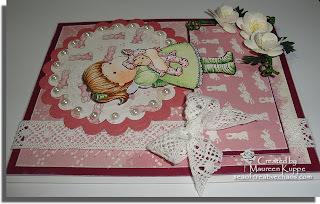 Yeah, I guess I can see that... my first card is on the "grungy" side. 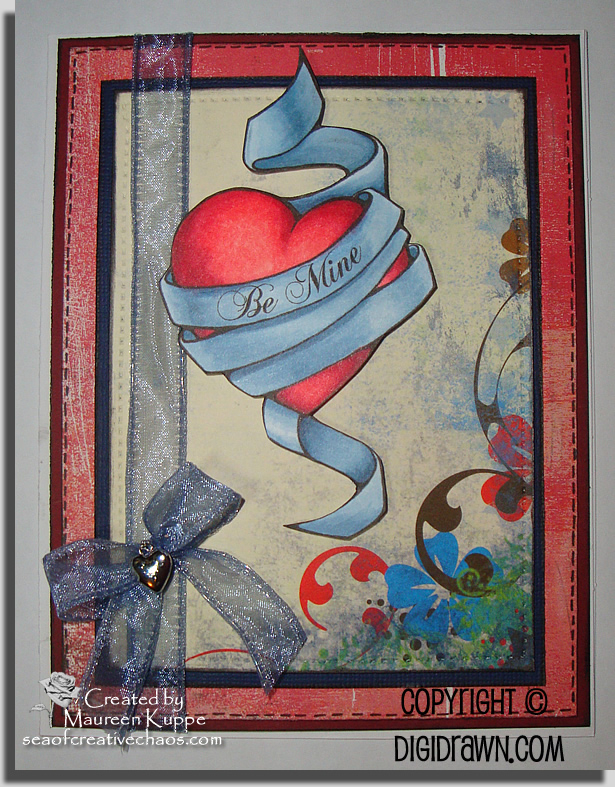 If you need a heart for YOUR Valentine cards, you can pick up this stamp over at DigiDrawn for only $ 2.50. Other particulars about my first card can be found at DigiDrawn here. Paper from my stash. I think the red is Basic Grey. The Wild Orchid roses are tinted with Copic Y28 and the Colorless Blender. A Martha Stewart leaf punch was used for the black leaves.